“FC Barcelona is one of the world’s top brands in team sports, so the opportunity to help shape development of what should be the premier sports complex in Europe, is something we’re really excited about," said Knapple, who's been doing naming-rights deals for more than 20 years and has more than $3 billion in such deals to his credit, including Staples Center and MetLife Stadium. has won an agency shootout to sell naming rights for FC Barcelona’s refurbished Camp Nou stadium in what’s likely to be the world’s largest naming-rights deal. Since Barça is one of the top three team sports brands globally, industry sources said that the deal to put a corporate name on the 59-year-old home of FC Barcelona should exceed $30 million per year. Looking for a comp? Really, the only thing that could command that stratospheric price level is Los Angeles Rams owner Stan Kroenke’s planned $2.5 billion stadium in Inglewood — but only if two NFL teams are playing there. AS Roma is seeking around $15 million to $20 million annually for naming rights to its new stadium, scheduled to open in August 2018. Van Wagner will take the naming rights of a refurbished Camp Nou stadium to market. The previous high in Europe was Emirates’ 15-year, $180 million deal struck in 2004 that included both naming rights to the new home of Arsenal and a jersey sponsorship for the team. Van Wagner President and CEO Jeff Knapple was also involved in that deal. about,” said Knapple, who’s been doing naming-rights deals for more than 20 years and has more than $3 billion in such deals to his credit,including Staples Center and MetLife Stadium. Van Wagner’s assignment also includes selling five or six founding partners sponsorship at Camp Nou, along with rights for the entire complex and for a new arena. Barça also has its jersey sponsorship out to bid at a reported $65 million annually. Qatar Airways has held those rights since 2013. 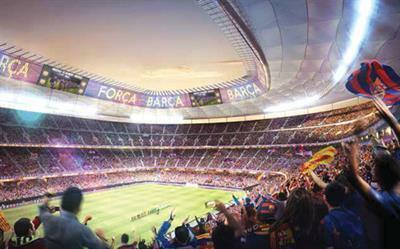 Scheduled to be completed in 2021, the Camp Nou refurbishment will add 6,000 seats to what is already Europe’s largest soccer stadium, giving it a capacity of more than 105,000. Other scheduled stadium improvements include a partial roof and premium seating. The upgrades are part of a $680 million refurbishment across FC Barcelona’s campus, under which the site will get a new version of the Palau Blaugrana arena, designed by HOK, along with additional planned commercial development including a hotel, a skating rink, restaurants, bars, office space, and new team offices. The complex already includes an FC Barcelona museum and store, and has long been a leading tourist destination in Barcelona, attracting millions of visitors annually, largely on non-game days. One X factor is how tolerant European fans will be as far as adding a corporate moniker to one of Europe’s most hallowed pitches. Especially in Spain, naming rights are not as ingrained, though club officials have been saying that money from selling those rights would underwrite the entire cost of a stadium modernization, which may placate some football purists. Van Wagner, which has been working toward the assignment for around 18 months, hopes to use its newfound FC Barcelona ties as a springboard to more European business. Knapple said the company will soon open a London office, in addition to having staff in Barcelona. Currently, only around 5 percent of Van Wagner’s revenue is from offshore; Knapple hopes to grow that to 30 percent, starting in Barcelona.